Oops!….I did it again. I made another breakfast recipe. I am sharing another breakfast recipe with you. Here’s the deal. The time of day where I am cooking and eating breakfast the light in my living room/dining room area is so bright and friendly. Slowly I am learning how to use my camera in manual mode. Slowly I am learning more and more about my camera and lens. Slowly. We have a flash too but I still haven’t figured out exactly where to point it or how to bounce that puppy, hence the lack of dinner worthy posts recently. This year I am on a mission to figure out my camera and part of that mission is to take better quality food photos for you. If something looks appetizing on the screen it is safe to bet you will be more likely to give it a try. And that is what I want. So that brings us back to breakfast. The light is so bright and friendly during the day hence the better-looking daytime photos. Pancakes. There are so many varieties of pancakes out there. Light, fluffy, dense, fruit filled, cinnamon filled, big giant dinner plate ones, and teeny tiny silver dollar ones. 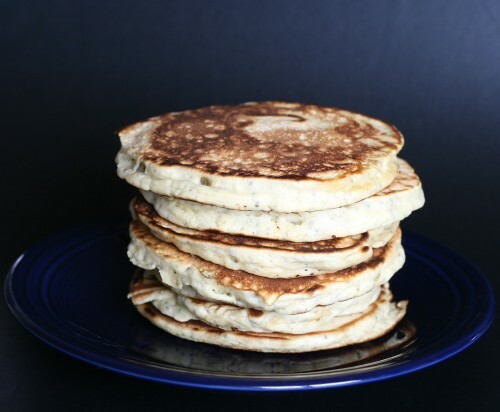 These are a medium sized pancake although you could make them as big or little as you’d like. I’d say these fall more on the dense side of light. They were perfectly filling. 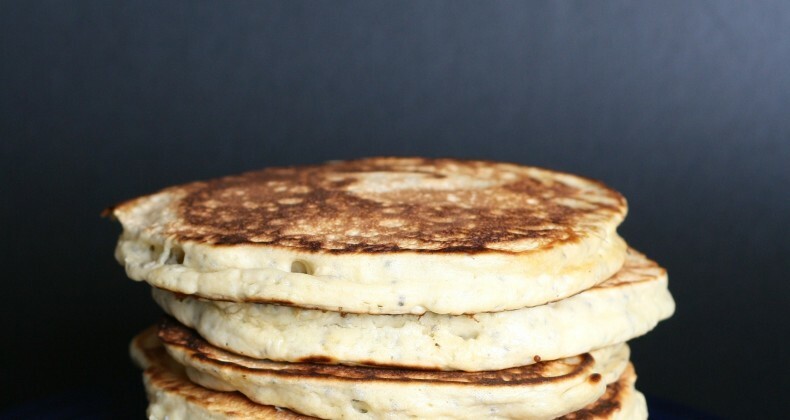 I added chia seeds to these pancakes but you could just as easily leave them out. I won’t be offended! Chia seeds are the new “buzz word” food it seems. I’m sure the Aztecs are rolling in their graves. They understood the healthy benefits of these little seeds long long ago. Chia seeds are high in omega-3 which is perfect for this landlocked gal that doesn’t consume tons of fish. Here we were pasting them on to funny shaped clay pots. Ch-ch-ch-chia! Chia seeds really don’t have any flavor. I have been adding them to my plain Greek yogurt for a few years now. So don’t be afraid to give them a try! So I have to know. What are your favorite pancake toppings? I like to eat my pancakes with butter and a tiny amount of *real* maple syrup. My husband loves to have his drowning in maple syrup. I also love a little butter and homemade applesauce. Mmmmmm. Mmm! What to learn more about the benefits of chia? If you would like a thinner pancake just add a little bit more milk, like 1/4 cup at first. Don't over stir this makes for hard chewy pancakes which isn't the desired texture. If chia isn't your thing add in an equal amount of ground flax seed. In a large mixing bowl beat eggs. Add in the rest of the ingredients. Mix quickly and carefully to combine. Heat a cast iron skillet or griddle to medium-medium high. Spray the pan with just a little cooking spray. I used a soup ladle and ladle on one scoop of batter, about 1/4 -1/3 cup. Cook pancakes until bubbles form around the outsides of the batter. Flip. Cook for a couple minutes until other side golden. I am surrounded by pancake lovers!! I am not a huge syrup fan so I like pancake day too. One and I am done. My husband eats his like my dad did- butter and sugar. My youngest son LOVES pancakes and all the toppings. Chocolate chip pancakes, preferably, with peanut butter and syrup. Chia seed is a great egg substitute. I am alergic to eggs. I came across this to help me be able to enjoy pancakes with my kids again. Chia is a substitute for eggs. You can put it with water for about 15 minutes a teaspoon and 1/4cup of water = 1 egg. So you can add the Chia and leave out the eggs. Thanks for the recipe..!! I’ve been a vegan for two months and I am just getting around to treating myself to pancakes. I asked at the health food store what to use as a substitute for eggs and they told me about chia. I couldn’t believe it. I’m a look and pour type of cook. Measure nothing but I know instinctively what to do. I experimented first to see if I was going to have to follow instructions. I started with a cup of whole wheat flower and about a tsp of baking powder. Put in a pinch of salt and that was my dry ingredients. I made the chia goo and let it set awhile. Checked to see if it was done (I probably used a couple tabelspoons full of the goo). I added it to the dry ingredients and then put this all under the faucet and added water. I do this gradually until the consistancy of the batter seems just right. I do not use milk. Not even a substitute milk. Haven’t used milk for thirty years. I like the water just fine. I cooked these just like other pancakes but they won’t get done in the middle so quickly. Let them cook for a while. Check to see if they are done before taking off the heat. I really liked the chia. There was a bit of seed left and I liked it a lot in the pancake. A bit of a crunch. These were absolutely delicious. I do not use oil. Not needed. I learned that a long time ago.